Members of the Society receive a newsletter every three months. 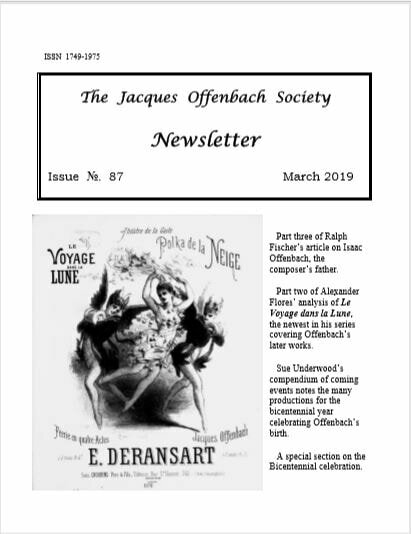 Part 3 of Ralph Fischer's article on Isaac Offenbach. A special section on the Bicentennial with news of events, recordings and books. ​We are always interested in articles, letters, snippets and reviews for inclusion in our newsletter. These can be submitted by email to our editor Bob Folstein. We do not hold a stock of printed back issues, however, it may be possible to email copies of individual articles. Printed copies are only available with payment to cover costs. Please contact the webmaster with your request in the first instance.